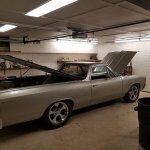 Chevelle Tech > Mechanical > Engine > '85 1/2 Ton Squarebody 400 SBC build? '85 1/2 Ton Squarebody 400 SBC build? I have a real slick original 85 Silverado c10, 305, TH350, 273 rear end. The truck has a 104,000 miles but runs perfect and gets 17-18 mpg. I'm thinking of building a 400 small bock to have ready to swap into it in the future. I would like to keep it as original as possible, but have the guts to pull a car trailer and decent economy. Any suggestions on the build? Re: '85 1/2 Ton Squarebody 400 SBC build? It was a rather simple build. .030 over w/ rebuilder pistons in it. I had a set of "good" GM iron heads on hand that I put on it. 2.02/1.60s w/ a mild port job and good valve job. Steam holes drilled. I can't remember what # heads they are but I am betting they were a set of iron bowtie heads as I had several sets at the time. Today I would use a set of Vortecs in a second. Way cheaper and better. Used a new comp cams hyd flat tappet RV cam that I had removed from another project. Stock crank and rods that were checked by machine shop. Edelbrock performer intake w/ reworked stock Quadrajet. New GM HEI distributor. Exhaust manifolds w/ no AIR tubes and true dual exhaust. 3.73 rears stock and the stock 700R4. Big GM radiator. HUGE difference in performance. No noticeable change in MPG. Frankly it ran how we both wish it did from new. Isn't a screamer but a lot more torque. We went up the hill towards Pocono Summit right after it was done to pick up a truck load of Chevelle parts. That thing never needed to downshift it just kept right on pulling. In 20 years he has pulled trailers and plowed snow w/ it. We have since had to put a trans and rear in it but that operator related I would say. Gov'Loks do go boom and make a mess inside. I had a similar experience as Ray. I had an 85 K5 Blazer that I bough new. 4WD 305 700r4 3.08 gears. It really was a pig towing. The trans started acting up around 150K so I bought a GM reman and at the same time took out the 305 and built a basically stock 87 350. Main difference was the hydraulic roller cam. I took everything external off the 305 including intake, carb, distributor etc and put it on the 350. Actually picked up a couple of MPG and major difference in power. I would build a basically stock 400. 8.5 - 9.0 compression so you can run it on 87 octane. Small basically stock hydraulic roller. You could probably do the same thing I did and just use everything from your 305. LeoP and aimhard like this. In my garage I have a couple pics of my '87 squarebody that had my nice 400 in it because the 305 puked and the 400 was on the shelf slated for another project. After vowing to pull it back out at some point because it was way too much for the application, I ended up selling the truck 12 years later with that engine in it. 4 bolt main, Carillo crank, H beam rods, 11.2 to 1 cr, Pro1 heads, blah blah. I'm still bummed about it, I can be dumb sometimes and that was one of 'em.